With a fairly well-balanced blend of left and right brain characteristics, I am a great fan of all the creative arts and have dabbled in a number of them; otherwise my life is filled with exacting practical tasks I also enjoy. Vibrant color, intricate design, and uplifting symbolism are all turn-ons for me, so two current exhibits have excited my creative urges: "Nexus" by Alicia Hunsicker, featured at Gallery in the Woods through August, and "A World Transformed" by Jessica Park, showing at the Brattleboro Museum & Art Center through October 26. "Visionary" is the adjective used frequently to describe both women's work, but their expressive styles and creative motivation are quite different. 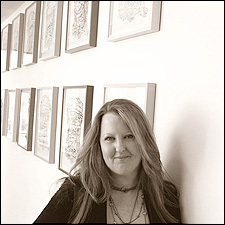 Alicia Hunsicker, who now lives and works just over the Vermont border in Leyden, Mass., earned a BFA in Printmaking, with a Graphic Design concentration, from UMass-Amherst in 1993. In an interview published online this week at studio24-7.blogspot.com, she shares that she has always had the calling to be an artist. After graduation, she learned about photography by working in a Vermont photo lab and also became interested in painting at that time. "I had taken one class while attending UMass but consider myself, for the most part, a self-taught painter. I married and moved to western Massachusetts, where I worked as an art teacher for a K-12 special education program. I found this very inspiring and spent a few years in the regional school system teaching art and mathematics." Motherhood interrupted Hunsicker's working life for a few years, and then she briefly ran a local gallery before rededicating herself to her painting process and studio practice while supporting herself as a graphic designer. "It was then I started showing my work seriously and eventually applying successfully for grants and residencies. As my work began to go places, I yearned to travel and go places, too." Most recently, her work brought her to Austria, Switzerland, and France. "I can see how my path in life has informed my journey as an artist and interestingly enough also my artistic process," Hunsicker explains. "What I thought were random decisions and chance occurrences reveal themselves to be a logical progression that has brought me to the place I am today." The work has changed over the years and now includes less-representational elements. The journey to "now" has also included many grants, fellowships, and scholarship awards; solo and group exhibitions in the U.S., Europe, Africa, and Asia; residencies at the Vermont Studio Center and an international program in Austria; and publication of her work in many exhibit catalogues, newspapers, and magazines, as well as at least one calendar. She is also represented in over 150 public and private collections in the U.S., Europe, and Asia. So, what is the creative thrust behind this notable success? The Artist Statement on her website -- aliciahunsicker.com -- begins, "My work reveals a cosmic discussion about the nature of all things. 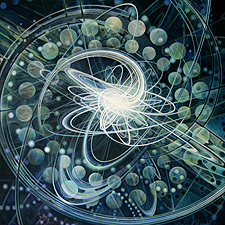 It fuses my knowledge of science and spirituality." She continues, "All beings, animals, and organic forms are expressions of a divine force -- each with its place and function in the journey of the whole. There is a profound beauty in nature's forms. I am fascinated by these repeating patterns and see them as part of the framework of creation, a divine language showing our Interconnectedness. 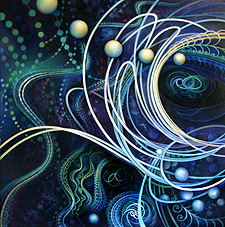 I am particularly drawn to concepts being explored in Quantum Physics and how they relate to the energetic realms that directly impact our minds, bodies, and consciousness. 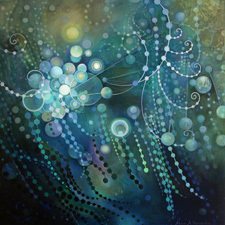 "I have many references to particles in my paintings. They are the fundamental building blocks of all things; to understand them revolutionizes our understanding of nature, from the minuscule world deep within atoms to the vastness of the universe and the limitless expression for the human experience. I am passionate about circles and lines that arc and swirl to create the structure of elegant forms, points of light, and the nature-inspired patterns that I am lost in while painting." With this inspiration behind her work, Hunsicker uses a special combination of techniques to achieve her expressive aims: "Initially I translate my ideas into preliminary 'sketches' using digital photographic techniques and manipulation through computer software. Once I have arrived at a composition I feel passionate about, I make a print in reverse." At a copy center, she experiments with black and white copies to decide on size, then prepares a surface on which to apply the "sketch" using an acrylic transfer process. "I am then left with a black and white image on which to establish an initial layer of acrylic color. From there I build up the surface with oil paint using traditional techniques. My process opens up exploration into concept, imagery, and paint application, which allows me to grow and discover while painting." 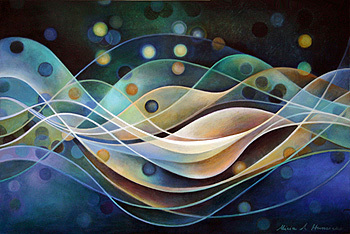 "When I am painting," Hunsicker reveals, "I am able to attain a level of deep surrender and sense a profound connection with the divine. I would even go so far as to say that painting is part of my spiritual practice. Like the meditative process of a yogi or monk, painting enables me to move from analytical thinking to an intuitive perception. It expands my consciousness into bliss and clarity, and allows me to see the deeper connections in life." I do believe that Hunsicker's work calls viewers to connect with their own inner life. The public is invited to see Alicia Hunsicker's inspiring work, and meet her, too, at Gallery in the Woods during a Gallery Walk reception on August 1, 5:30 to 8 pm.